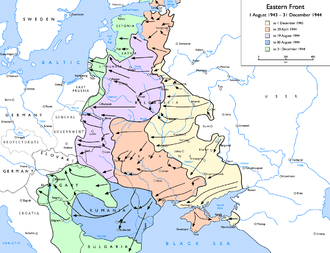 Battles and operations of the Soviet–German War — on the Eastern Front of World War II. Pages in category "Battles and operations of the Soviet–German War"
Soviet forces and local militias launched separate but loosely cooperative operations that undermined German control of Belgrade and ultimately forced a retreat. Martial planning was coordinated evenly among command leaders, and the operation was largely enabled through tactical cooperation between Josip Tito and Joseph Stalin that began in September 1944. These martial provisions allowed Bulgarian forces to engage in operations throughout Yugoslav territory, the spearhead of the offensive was executed by the Soviet 3rd Ukrainian Front in coordination with the Yugoslav 1st Army Group and XIV Army Corps. There were additional skirmishes between Bulgarian forces and German anti-partisan regiments in Macedonia that represented the campaigns southernmost combat operations. By the summer of 1944, the Germans had not only lost control of all the mountainous area of Yugoslavia but were no longer able to protect their own essential lines of communication. Another general offensive on their front was unthinkable, and by September it was clear that Belgrade, in August 1943, the German Wehrmacht had two army formations deployed in the Balkans, Army Group E in Greece and the 2nd Panzer Army in Yugoslavia and Albania. Army Group F headquarters in Belgrade acted as a joint high command for these formations, as well as for Bulgarian, after the collapse of the uprising in December 1941, anti-Axis activity in Serbia decreased significantly, and the focus of resistance moved to other, less populated areas. Consequently, although Serbia had great significance to the Germans, very few troops remained there. In the following years, Tito repeatedly tried to reinforce the forces in Serbia with experienced units from Bosnia. From the spring of 1944, the Allied command had assisted in these efforts, in July 1944, German defenses began to fail. After the failure of Operation Rübezahl in Montenegro in August 1944, Army Group F command responded by deploying additional forces, the 1st Mountain Division arrived in Serbia in early August, followed by the 4th SS Panzergrenadier Division from the Thessaloniki area. The Allied command, and the NOVJ supreme command, predicted this scenario, on 1 September 1944, a general attack from the ground and from the air on the German transport lines and installations began. These attacks largely hindered German troop movements, with units disassembled and tied to the ground, in the meantime, the 1st Proletarian Corps, the main partisan formation in Serbia, continued with reinforcing and developing its forces and with seizing positions for the assault on Belgrade. On 18 September Valjevo was taken, and on 20 September Aranđelovac, Partisans achieved control of a large area south and southwest of Belgrade, thus forming the basis for the future advance towards Belgrade. But the combined actions of Yugoslav partisans and Allied air forces impeded German movements with Ratweek, as a result of the Bulgarian coup détat of 1944, the monarchist-fascist regime in Bulgaria was overthrown and replaced with a government of the Fatherland Front led by Kimon Georgiev. Once the new government came to power, Bulgaria declared war on Germany, under the new pro-Soviet government, four Bulgarian armies,455,000 strong were mobilized and reorganized. In early October 1944, three Bulgarian armies, consisting of around 340,000 men, were located on the Yugoslav – Bulgarian border. The campaign took place in the northern section of the Eastern Front and consisted of two major phases, the Battle for Narva Bridgehead and the Battle of Tannenberg Line. The Soviet Kingisepp–Gdov Offensive and Narva Offensives were part of the Red Army Winter Spring Campaign of 1944, following Joseph Stalins Broad Front strategy, these battles coincided with the Dnieper–Carpathian Offensive and the Lvov–Sandomierz Offensive. A number of volunteers and local Estonian conscripts participated in the battle as part of the German forces. The Soviet units established a number of bridgeheads on the bank of the river in February while the Germans maintained a bridgehead on the eastern bank. Subsequent attempts failed to expand their toehold, German counterattacks annihilated the bridgeheads to the north of Narva and reduced the bridgehead south of the town, stabilizing the front until July 1944. The Soviet Narva Offensive led to the capture of the city after the German troops retreated to their prepared Tannenberg Defence Line in the Sinimäed Hills 16 kilometres from Narva, in the ensuing Battle of Tannenberg Line, the German army group held its ground. Stalins main strategic goal—a quick recovery of Estonia as a base for air and seaborne attacks against Finland, as a result of the tough defence of the German forces the Soviet war effort in the Baltic Sea region was hampered for seven and a half months. Terrain played a significant role in operations around Narva, the elevation above sea level rarely rises above 100 meters in the area and the land is cut by numerous waterways, including the Narva and Plyussa Rivers. The bulk of the land in the region is forested and large swamps inundate areas of low elevation, the effect of the terrain on operations was one of channelization, because of the swamps, only certain areas were suitable for large-scale troop movement. On a strategic scale, a choke point was present between the northern shore of Lake Peipus and the Gulf of Finland. The 45 kilometre wide strip of land was bisected by the Narva River and had large areas of wilderness. The primary transportation routes, the Narva–Tallinn highway and railway, ran on an east-west axis near, there were no other east-west transportation routes capable of sustaining troop movement on a large scale in the region. The Battle of Breslau, known as the Siege of Breslau, was a three-month-long siege of the city of Breslau in Lower Silesia, lasting to the end of World War II in Europe. From 13 February 1945 to 6 May 1945, German troops in Breslau were besieged by the Soviet forces which encircled the city as part of the Lower Silesian Offensive Operation. The German garrisons surrender on 6 May was followed by the surrender of all German forces two days after the battle, in August 1944, Adolf Hitler declared the city of Breslau to be a fortress, ordering that it must be defended at all costs. He named Karl Hanke to be the citys Battle Commander, on 19 January 1945, the civilian population was forced to leave. The German Army, aided by the Home Guard and slave labourers, turned the city into a military fortress, a large area of the city center was demolished and turned into an airfield. Late in January, a regiment of Hitler Youth was sent to reinforce the garrison of Festung Breslau, SS regiment Besslein took part. On 2 February 1945, Hanke presented colors to the newly formed Home Guard units in Breslau, on the same day, Major General Hans von Ahlfen became the garrison commander of Fortress Breslau. Ahlfen, who commanded for three weeks, had been personally selected by the Commander-in-Chief of Army Group Center, Ferdinand Schörner. On 2 March 1945, Infantry General Hermann Niehoff replaced Ahlfen as garrison commander, Niehoff held the position until the final surrender on 6 May 1945. The 1st Ukrainian Front forces besieged the city with the 22nd and 74th Rifle Corps,50,000 German troops defended the city. 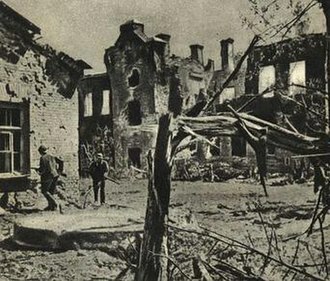 The Siege of Breslau consisted of destructive house-to-house street fighting, the city was bombarded to ruin by artillery of the Soviet 6th Army, as well as the Soviet 2nd Air Army and the Soviet 18th Air Army, and the destruction caused by the German defenders. On 15 February, the German Luftwaffe started an airlift to the besieged garrison, for 76 days, until 1 May, the Luftwaffe made more than 2,000 sorties with supplies and food. The operations codename was a reference to the German card game Doppelkopf. 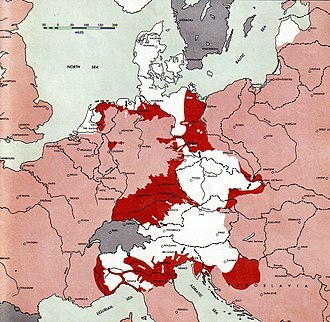 German counter-attacks failed to restore it, and significant elements of the German armed forces were left isolated, the Oberkommando des Heeres made immediate plans for an offensive to restore the connection between the two Army Groups. A number of armoured formations were assembled under Army Group Centre in Courland with orders to attack towards Jelgava, von Sauckens XXXIX Panzer Corps opened operations on 18 August. Strachwitz reached Sixteenth Army at Tukums by midday, the operation had failed in its more ambitious objectives of retaking Šiauliai or of cutting off the 6th Guards Army threatening Riga. A second German spoiling attack, was planned to destroy Bagramyans forces in the salient below Riga, the main strike force was the reorganised XXXIX Panzer Corps, Third Panzer Army having been placed under the temporary overall control of Army Group North. 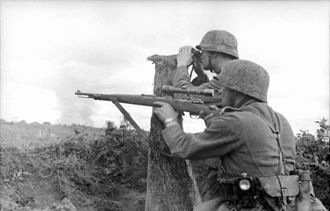 The German forces assumed a defensive configuration, the Red Army attacked again on 5 October, in the Memel Offensive Operation. 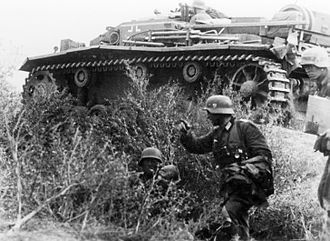 The offensive failed, due to strong resistance by the Wehrmacht. As a result, it is known through German accounts of the defence and because of the atrocities that were committed by troops of the 11th Guards Army. The operation was planned as a result of the success of the Memel Offensive Operation to the north, stavka permitted Chernyakhovsky to further exploit this success by attacking along the Gumbinnen - Insterburg - Königsberg axis deep into East Prussia. 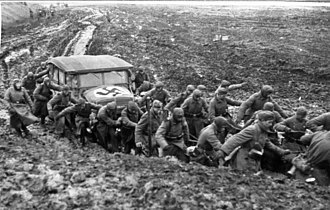 Chernyakhovskys plan involved using the 5th and 11th Guards Armies to break open the German defensive lines, before pushing through exploitation forces from the 2nd Guards Tank Corps, the 31st and 39th Armies would advance on the flanks of the main force. The opposing German forces, from the Third Panzer and Fourth Armies, were aided by the presence of substantial fortifications, the flanking armies commenced operations the next day, by which time units of the 11th Guards Army had crossed the East Prussian border. The Soviet troops ran into extremely strong resistance, however and it took them four days to penetrate the initial tactical defences, while the second defence line was so strong that Chernyakhovsky was compelled to commit the 2nd Guards Tank Corps to break it. Combat in the Transdanubian Hills lasted from 6 to 21 March 1945. The German attacks failed to achieve their objectives and were eclipsed by the large-scale Soviet offensive from the area of Lake Balaton to Vienna, German forces south of Lake Balaton were organized into two groups. The northern group was General de Angelis 2nd Panzer Army which had the town of Kaposvár as its objective, facing the 2nd Panzer Armys northern flank was General Sharokhins Soviet 57th Army. The area in front of the 2nd Panzer Armys southern flank was defended by the III Corps of General Stoychevs Bulgarian First Army, the other German group was General von Erdmannsdorffs LXXXXI Corps of Army Group E in northern Yugoslavia. LXXXXI Corps had concentrated near Donji Miholjac and Valpovo, across the Drava River at Donji Miholjac, the IV Corps of the Bulgarian Army defended the routes leading to Pécs and Mohács. Northeast of Valpovo and across the Drava, General Nađs 3rd Army of Josip Broz Titos Yugoslav National Liberation Army defended the routes leading to northeast Yugoslavia, named Forest Devil, the LXXXXI Corps operation had as its primary objective the town of Mohács. The 57th Army was the southernmost unit of the Red Army on the eastern front, south of the 57th Army, the Germans of 2nd Panzer Army and Army Group E were confronted by Soviet allies—Bulgarian forces in southern Hungary and Titos forces in Yugoslavia. An attack in these areas offered the Germans the opportunities of attacking the less well equipped Bulgarians, alerted that a German attack south of Lake Balaton was imminent, Marshal Tolbukhin deployed additional artillery units to reinforce the 57th Army and the Bulgarian III Corps. The LXVIII Corps of the 2nd Panzer Army made the main thrust south of Lake Balaton on March 6 with an attack against the Soviet 57th Army, with three infantry divisions aided by a thaw that caused muddy ground, the Bulgarians held as did the 57th Army. By March 12, LXVIII Corps had moved the axis of its attack against the 57th Army, in the Donji Miholjac area, the German LXXXXI Corps attacked on March 6 with about 35,000 troops. On March 7, General Stoychev ordered the 16th Infantry Division in the Bulgarian III Corps to reinforce the 3rd Division at Donji Miholjac, during March 8–9, some Bulgarian elements began a military evacuation of Pécs. At this, Marshal Tolbukhin ordered the Soviet 133rd Rifle Corps out of reserve to reinforce the Bulgarian IV Corps, during the march to the battlefield, the Soviet troops encountered Bulgarian forces and fired upon them because the Bulgarian helmets resembled those of the Germans. The 133rd Rifle Corps, reinforced by Soviet artillery units and supported by aircraft, subsequently took up positions at the critical junction of the Bulgarian. 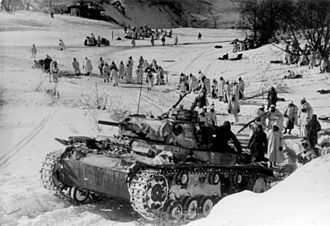 Ironically, the German troops found themselves facing Panzer IV tanks operated by the Bulgarian Army, near Valpovo, the German 11th Luftwaffe Field Division, supported by two regiments of dismounted Cossacks, crossed the Drava and pushed about two kilometers to the northeast by March 8. In the face of resistance by the Yugoslav 12th Partisan Corps, this attack slowed, and by March 21, the 6th SS Panzer Army was instead deployed north of Lake Balaton in an area the Hungarian military warned was unsuitable for an armored attack. In Bulgaria the battle is known as the Drava epic because of the bravery shown by the Bulgarians in withstanding the attack of a better trained and equipped adversary. 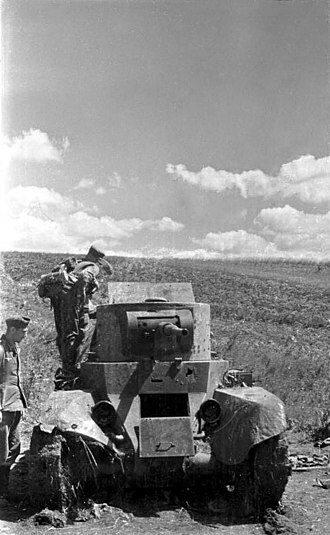 A column from Panzerabteilung 40 during the advance on the Murmansk railway, 1941. Falkenhorst meets with Siilasvuo during planning. Yugoslav Partisans in liberated Belgrade, October 1944. A monument to the battle on the Slovak side of the Dukla Pass. Soviet Red Army troops manning two M17 Multiple Gun Motor Carriage (MGMC) self-propelled anti-aircraft vehicles (half-tracks) in Danzig in March of 1945.